All field trip participants must fill out and bring a waiver form. Click the button below to download/print, fill out and turn in at the start of any trip. See additional field trip notes at the bottom of this page. Hey members! 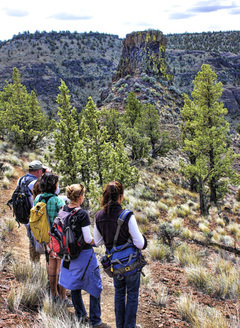 Have an idea for a hike or an event? Want to organize and lead it? For our chapter thrive and survive, we need volunteers! You don't need to be a botanist or plant expert to lead a hike - just a desire to have some fun. A Pale Swallowtail enjoys a Scarlet Gilia. NPSO chapter field trips require a reservation as some trips are limited to a certain number of attendees and we know who to expect. All NPSO field trips are open to the public and newcomers and visitors are always welcome. Trips may be strenuous and/or hazardous. Participation is at your own risk. All participants must fill out a state NPSO required field trip waiver. Please let your trip leader know about any physical limitations or medical conditions you may have. Field trips take place in a variety of weather and terrain conditions, so proper dress and footwear are essential. Bring hiking essentials such as water, snacks, lunch, bug spray, sunscreen, hiking poles, etc. Carpooling is encouraged when possible. If you decide to ride with others, we encourage a contribution to the carpool driver to share fuel costs. A Northwest Forest Pass may be required for some field trip locations for parking. The Forest Service and other agencies have policies limiting group size in many wilderness areas to 12 to limit human impacts on fragile areas. Groups using wilderness areas should be no larger than 12.